A good carrot cake is meant to be eaten throughout the year, seasons are just an added excuse! Or so thinks yours truly! The last of the bits and pieces of Ottolenghi's Carrot Cake stashed away in the freezer were devoured long ago. Winter came and went, I almost could taste and smell the cake whenever I saw carrots. Coconut, nuts, carrots and spices, irresistible! But life has been a tad busy of late and I did not get a chance to bake that cake again. Thank God for fresh carrots all year round, I finally got some to bake a cake. Only this time around it had to be a healthier, easier version I could bake more often. The 100% whole wheat carrot cake page in the King Arthur Whole Grain Book has been thumbed often enough, so I really wasn't searching for a recipe. And when the cake promises to be one which is hard to tell as whole wheat, I have no second thoughts! 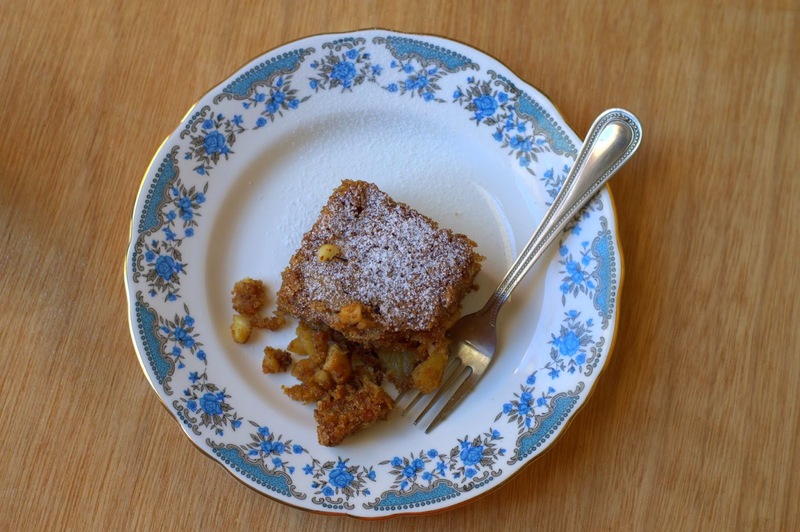 Delivering what it promises, it indeed is a delightful cake with a surprisingly tender crumb. Succulent pineapple bits make a lovely addition. Very soft and so good warm, I had to remind hubby and son that I still had to take some pictures. The advantage of baking a cake in a square tin, you can actually taste the cake before you take the mandatory pictures! What's even better is, it's a simple and easy cake to bake. I like these cakes plain, dress it up with cream cheese frosting if you wish! Pre-heat oven to 180 C / 350 F. Line an 8'' square tin with baking parchment, grease lightly. You could alternatively use a 9'' or 8'' round tin or a 9x13 pan for double the recipe. The baking time will vary. Sift together the flour, baking powder, soda, spices and salt. Set aside. In a medium sized bowl, using a hand mixer, beat the eggs on the lowest speed for about 30 seconds. Add the oil, vanilla and orange zest, beat 30 seconds again. Tip in the sugar, beat again just to incorporate, about 30 seconds. Add the flour, beat 30 seconds on low speed till smooth. Using a spatula, mix in the carrots, pineapple bits, coconut and nuts. Transfer the batter to the prepared pan. Bake for 40-45 minutes or till a toothpick inserted in the center comes out clean. Cool completely in the pan. Cooling it for a few hours should give you neater slices. Dust with confectioner's sugar or frost with cream cheese, both entirely optional. Combine the butter, cream cheese and vanilla in a medium bowl and beat them together till light and fluffy. Add the sugar gradually, beating well. Stir in the nuts, then the milk, a little at a time, till the frosting is of a spreadable consistency. Spices : The recommended amount of spices is 1 1/2 teaspoons cinnamon and 1/4 teaspoon nutmeg. I used lesser (above)and used cloves in place of the nutmeg. I may add about 1/8 teaspoon more cinnamon next time. You can use 1 cup raisins in place of half of 8 oz can pineapple bits. Sheet cake - 45-50 minutes. 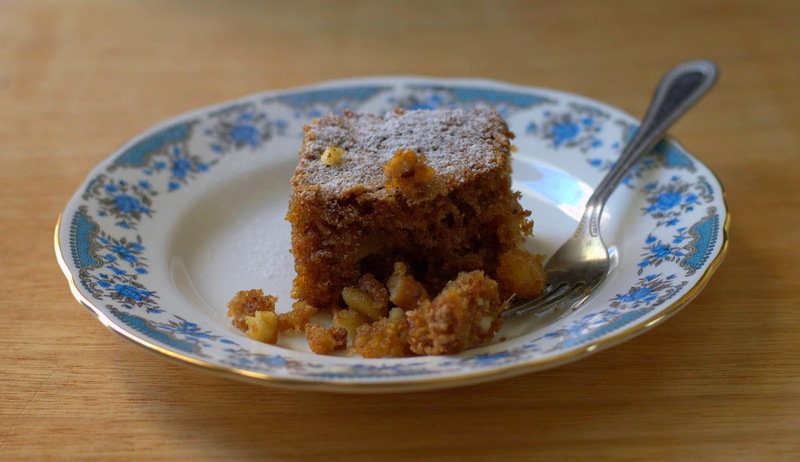 This tasty cake, I know will be made regularly to feed the sweet tooth of the foodie son and the fruit-cake loving hubby. Now, we can't really deprive the baker of her slice. Right? Forgive me for me being irregular, hope to be around more often! So, what's baking in your home to feed the exam fervor? That's a super tasty piece of cake I guess!I bake eggless carrot cake which my daughter likes a lot :).your cake with pineapple,nuts and the goodness of spices + eggs ... sure is better than a simple carrot cake!! This sounds like a cake that I must try very soon! Bookmarked! 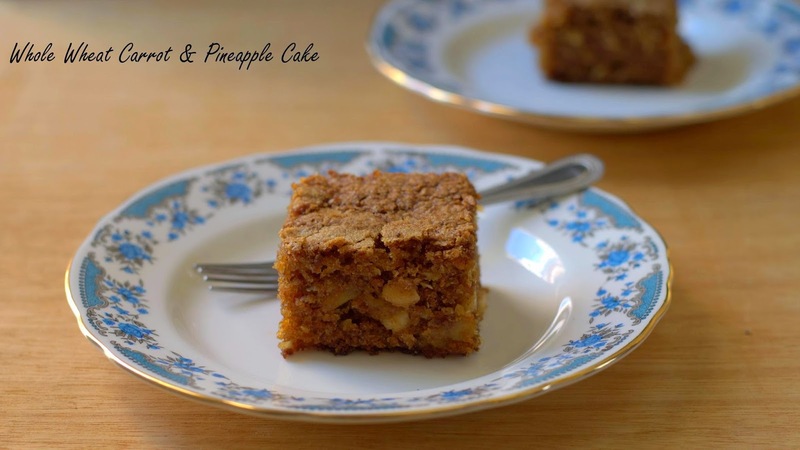 Whole wheat, carrots, pineapple and Suma's cake - need I say more?